She's dizzy, she's daffy, she's just a bit laffy�but, she's still our gal! 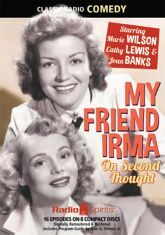 Marie Wilson stars as the blonde, beautiful, and bewildered Irma Peterson in the hit postwar sitcom My Friend Irma. Cathy Lewis and Joan Banks co-star as her level-headed roommate Jane Stacy, with John Brown as her deadbeat boyfriend, Al. Here are sixteen fun-filled episodes featuring Hans Conried, Leif Erickson, Gloria Gordon, and Alan Reed. Get ready to slap your knee�and your forehead!